Discounted Tickets & Tees/Tanks are available via our PRE-SALE Order Form. Payment in full must be received with your order. ONLY student accounts with a valid credit card or checking account on file are eligible for online orders. 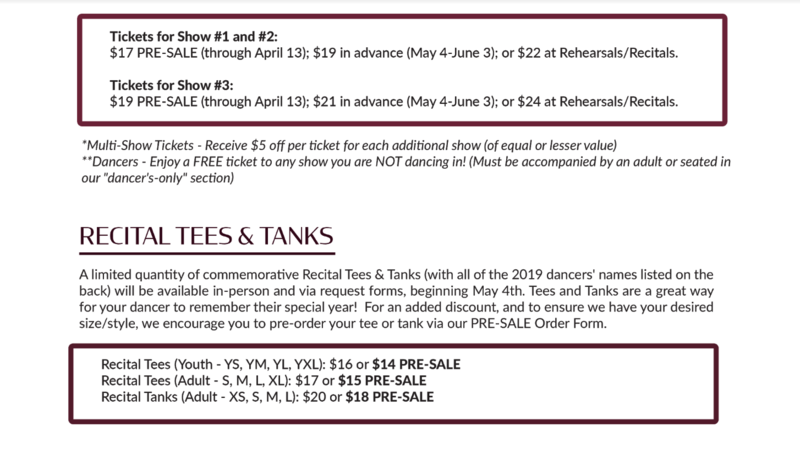 PRE-SALE Order Forms and Online Orders will be time-stamped as they are received, however, orders will NOT be filled until AFTER all in-person tickets have been purchased during Ticket Sale Day from 8am-1pm at the studio on Saturday, May 4th.